James Jeonghwan Kim | The Chamber Music Society of Lincoln Center. Cellist James Kim has appeared as soloist with orchestras such as the Boston Symphony, Royal Philharmonic, Tongyeong Festival, Juilliard, New England Conservatory Youth Philharmonic, and Korean Broadcasting System with conductors such as David Zinman, Alexander Shelley, Michael Sanderling, Keith Lockhart, and Benjamin Zander. A recipient of Salon de Virtuosi’s Sony Career Grant and the Jack Kent Cooke Foundation Scholarship, he made his first international appearance at the 2006 David Popper International Cello Competition in Hungary, where he won First Prize. 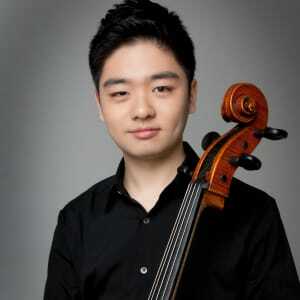 He was a top prizewinner at the 2015 Isang Yun International Cello Competition, where he was also awarded Special Prize. He has given solo recitals and chamber music concerts sponsored by Kumho Foundation's “Beautiful Thursday” and Prodigy Recital Series at Kumho Art Hall, WQXR 's Midday Masterpieces Series at the Greene Space and Robert Sherman’s Young Artist Showcase, Sejong Soloists, Garden City Chamber Music Society, Ravinia Festival Steans Institute, and Chamber Music Society of Lincoln Center Encounters. His performances have been broadcasted on WQXR and National Public Radio. Principal teachers include Susan Moses, Janos Starker, Laurence Lesser, Aldo Parisot, and Joel Krosnick. He is currently an Artist Diploma candidate at The Juilliard School, where he is also Studio Teaching Assistant. He performs on a Matteo Goffriller cello from Venice c. 1715, generously loaned by The Samsung Foundation of Culture of Korea and The Stradivari Society of Chicago.